"This yummy recipe is easy to make. This makes a great appetizer as well as a small meal." 1Heat the olive oil in a skillet over medium heat. Place the pot stickers into the hot oil flat-side-down. Cook until the bottom has turned golden brown, 1 to 2 minutes. Add the edamame and pour in the water. Cover, and bring to a simmer over medium-high heat. Cook until the pot stickers have completely thawed and are hot on the inside, 8 to 10 minutes. 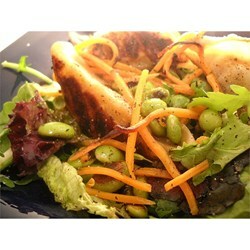 2Scrape the pot stickers and edamame into a mixing bowl, and add the lettuce and salad dressing. Season to taste with salt, and toss to mix. Serve immediately.